Patio Furniture Deals – Outfit your Patio and Garden for Less! As patio furniture is a seasonal item, there are huge variations in pricing throughout the year. If you want to stretch your dollar as far as you can to get the best patio furniture you can for your price point, you’ll want to keep deals in mind. This article is focused on bringing you the best patio furniture deals you around, and we will do our best to keep this page constantly updated with fantastic patio furniture sales and bargains throughout the year. In general, the best time to buy patio furniture online is off-season, while it’s best to purchase at the end of the season in stores. You’ll be able to grab some absolute steals by taking this strategy, but of course, your selection may be somewhat limited. We’ve hunted down a whole bunch of fantastic deals, steals, and sales on patio furniture and decor. We present these to you, as well as some classic high quality, bargain-priced furniture, below. [Read more…] about Patio Furniture Deals – Outfit your Patio and Garden for Less! If you’re an avid gardener or someone who wants to try their hand at horticulture, you more than likely know the importance of good growing conditions. You want to make the most of the land you have to work with and keep your plants going for as much of the season as possible. Some plants need more sunlight than others while some enjoy heavy humidity. Many plants also need to be brought in for the winter, which can create a mess if you don’t have a lot of places to store them. The solution to all of this is a greenhouse. What is the Meaning of the Pink Flamingo in the Yard? When you’re thinking of items that represent American culture, you might list off anything from cowboy boots to denim jeans to big cars. But, don’t forget about the pink flamingos! And what is the meaning of the pink flamingo in the yard, anyway? America is not known just for John Wayne, but also John Waters! We don’t just love the Bald Eagle, we also love our shocking pink birds with long legs and a habit of showing up in yards from Miami to Seattle. How did this happen? How did we fall under its beady-eyed spell? Flamingos, speaking from the whole natural history perspective, are graceful birds, genus Phoenicopterus. They spend a lot of their time – most of their time – standing about on one leg, swishing through water with their big bills as they search for food, and hanging out with other flamingos. They’re also absolutely experts at internet memes. We’ll be watching that on loop all day. Plastic pink flamingos really started showing up in the 1950’s, when American homeowners could purchase them on everything from wallpaper to upholstery fabric to paint-by-number paintings. Their slightly exotic pinkness went well with rattan furniture and dreams of a Florida beach house. They adorned a million bathrooms, and marched their way onto front yards and gardens in the late 1950’s. And now they’re often used for charity! By this time, they had been pushed into glorious plastic production by artist Don Featherstone. 1957 found Featherstone at Union Products of Massachusetts. His job: create three-dimensional lawn art. His masterpiece: The pink plastic flamingo. Pink was an extremely on-trend color at the time, and there weren’t a lot of pink animals to work with. As actual live flamingos were in scant supply in Leominster, MA, Featherstone relied upon National Geographic photos to create the originals. It took him about two weeks to create the molds for the birds, which were manufactured using polystyrene and injection molding. They were immediately popular with the American public, who began snapping up pairs of the birds at the introductory price of $2.76 per set. The tropical joy continued unabated until the 1960s rolled around. Changing times meant that people were encouraged to ditch the plastics and return to the natural. Cultural critics were hard on cheerful lawn decor, and the tastemaker magazines encouraged the public to get rid of the garden gnomes, tiki statues, and lighthouses. And give up the flamingos. It was a sad day in 1970 when the thoroughly American Sears catalog quit selling them. The good news is that the originals are now once again available (see below)! For a great history of Don Featherstone and his pink flamingos, check out Splendor on the Grass. Obviously, the birds had staying power. They re-emerged once again in the ‘70s as a kitsch icon. Many point to John Waters’ 1972 film “Pink Flamingos” as something that put them back into the public consciousness. Although the movie was decidedly not about the birds – it was actually about drag queens – it did feature a trailer in a hippie commune that had a pair of lawn flamingos out front, and of course, had the name. In a movie that was about bad taste, the pink flamingoes were summoned to personify it. Armed with a knowing wink about kitschiness, they became popular in ways that would never have been imagined in the 1950s: Decorating gay bars, printed on t-shirts, even making their way across college campuses in the 1980s in large flocks. By the early 1980s, “Flamingo” was an actual decorating theme. Enthusiasts could eat from flamingo plates, drink from flamingo tea glasses, and do it all by the light from the flamingo candlesticks. Flamingos have continued to flock through the American public consciousness ever since their origination in the 1950s. They’re an enduring symbol of beach life and summer for many, and a sly wink against conventional style for others. The internet is filled with bikini models on cow-sized flamingo pool floats, they’re emblazoned on mobile phone cases and car seat covers. and yes, you can still get the flamingo wallpaper. There’s also a commonly-cited suggestion that if you see pink flamingoes in the yard, there’s a reasonable chance that the owners of the house are swingers. There’s also a lot of discussion about how this is completely ridiculous, and we don’t suggest that you go knocking on any doors looking for a fun time because you see a flamingo in the yard! In recent years, fundraisers, charities, and pranksters have begun setting up flamingo “invasions”, or flocks of plastic flamingos. Typically, under cover of darkness, an organization sets up a flock of flamingoes in the yard of a home or business, with a sign accompanying the flock. The sign explains that the flock has been placed for charitable reasons, and identifies the charity. Flocking victims then are requested to pay a fee, often per flamingo, to have them removed. At that point, the flocking victim then gets to pick the next target for flocking, and the flock descends on yet another yard. This continues on until the end of the fundraising event, and it functions somewhat like an old-school chain letter from the early 2000s. Naturally, there are some victims who are curmudgeons and who don’t appreciate the flocking, but for the most part, the flocking is all in good fun and is for charitable reasons. You should consider that your recipient may simply remove the flock and throw them away, resulting in the loss of your flock. The main expense if you want to start a flocking campaign is obviously your original flock! 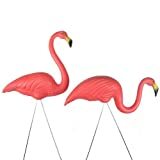 You can buy knockoff pink flamingo yard ornaments in bulk, though if you want the original Don Featherstone flamingoes, you’ll have to pay a good deal more for them. Here’s an example of a 10-pack of flamingoes, which is a good start. Of course, managing multiple flocks at once will definitely increase your fundraising effectiveness! You’ll also need to consider your time involved in placing and removing the flock. Once you have your initial flock, you’ll only need to replace broken ones as you go. $60 Donation: Insurance that your home cannot be re-flocked at a later date. And you almost certainly want to try to sell Insurance to people who have not already been flocked! 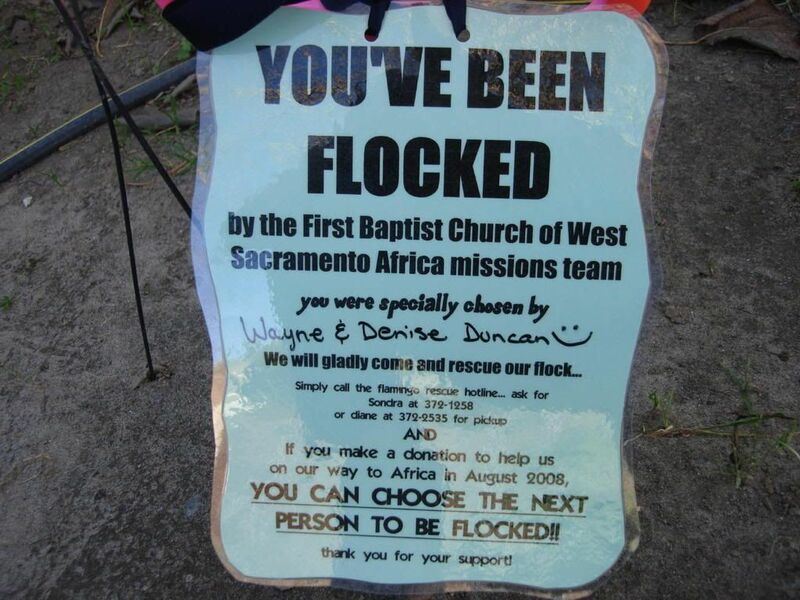 At the bottom of your sign, you may want to include a gentle suggestion that if the victim is not in a position to donate to the charity at this time, they can call to have the flock removed at no charge. You should play with the monetary values to maximize your potential earnings. And you can choose if you prefer to price your promotion as a per-flamingo offering, or if you’d rather have a single price to take care of the whole flock. The larger the flock, the more attention it will get! However, if you start asking a huge amount of money to remove the flock, potential donors may get turned off. You’ll have to try to find the right balance for your area, charity in question, and needs. You should probably alert the town or city government, and/or the local police department before you start randomly flocking people. A flocking victim may misunderstand the circumstances, and call the police and/or the town government to complain about the pink flamingoes and the trespassing. By pre-emptively getting their approvals, and by letting them know that this is for charity through your organization, you’ll save yourself from some headaches and a ruined fundraising event. Additionally, you’ll want to make as long a list as possible of potential flocking targets. These should include businesses and residents. Local news media love fun stories like these and can be a wonderful asset in the promotion of the flocking charity. Additionally, businesses may love the exposure a flocking gets — a large flock of pink flamingoes placed outside a business is certainly a striking unexpected scene, and many retail businesses are thrilled by the exposure it can bring! If you’re looking to do a pink flamingo flock fundraiser, you must consider the reaction of the person, people, or business you intend to flock. You don’t want to pick that grump who takes the flamingoes down and throws them away! You want to choose people who will take the flocking in good fun, and who will be able to handle the financial burden of removing the flock. Businesses may even want to ask their customers to help remove the flock with further charitable donations, and it can be quite effective to try to get a business to challenge a rival business to raise money for flock removal. You could consider decorating your flock to further draw attention to your cause. While a large batch of flamingoes in a small space will certainly draw attention regardless, you can up the notoriety by adding outfits, perhaps some different paint, silly faces, and the like. Use your imagination, and you will only increase the power of your flocking charity campaign. After more than 50 years, perennial popularity, and an enduring symbolism for both summer fun and anti-classicism, the pink flamingo has earned its spot on the American icon list. They’ve even been added to the National Museum of American Museum at the Smithsonian: Catalog number 2012.0140.02: “Pink Flamingo Lawn Ornament”. The original molds made by Featherstone are still used to manufacture lawn flamingos – still sold in pairs, still with one flamingo looking rather regally off into the distance while its mate searches for food below. Featherstone and his wife enjoyed their own personal flock in their Massachusetts yard until his death in 2015, clearly feeling that they had a classic on their hands. And if you’ve been a flocking victim, let us know how it turned out! Best Compost Bin Design. Mana for your Garden! Compost Bins are helpful systems that efficiently break down household waste and yard waste, and transform these waste objects into valuable, high-potency compost that can be incredibly beneficial to soil. There are a few major types of compost bin design that can be used, and each has pros and cons. In this article, we’ll look carefully at each of these systems, and find the best compost bin design for various circumstances. We’ll also look at a few product examples in the various categories and make a few recommendations. [Read more…] about Best Compost Bin Design. Mana for your Garden!